Ryan Schott joined the lab as a summer research student working on the anatomy and systematics of pachycephalosaur dinosaurs, in particular Colepiocephale lambei. He continued on to do an Honours Thesis on individual and ontogenetic variation in the cranial horns of horned lizards. 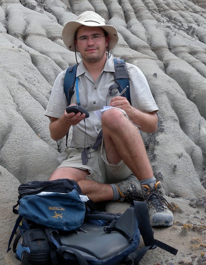 After graduating, Ryan began a Master’s continuing his studies on pachycephalosaurs, focusing on the diversity and ontogeny of pachycephalosaurs from the Belly Rive Group of Alberta. Ryan completed his M.Sc. thesis in 2011. Now he is working on his Ph.D. at the University of Toronto where he is studying the evolution of visual pigments in reptiles. Schott RK, Evans DC, Williamson TE, Carr TD, Goodwin MB (2009) The anatomy and systematics of Colepiocephale lambei (Dinosauria: Pachycephalosauridae). Journal of Vertebrate Paleontology 29: 771–786. Download Ryan’s Completed MSc thesis here.